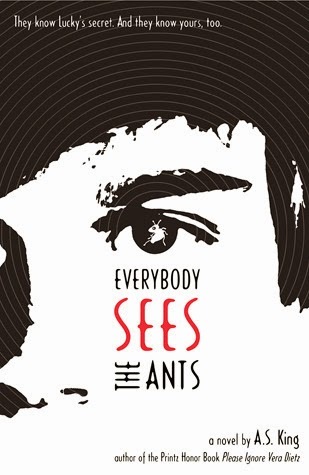 Everybody Sees the Ants by A.S. King is a fiction novel that tells the story of a boy named Lucky who has for years lived as a victim of bullying due to one of his abusive classmates Nader. This book actually took quite a while for me to finish. One reason is that the character who bullies Lucky, Nader, is so aggravating. The way he treats Lucky really throughout the whole book saddened and angered me. This happened so much in the beginning to the point where I would read the book for less than 20 minutes and then put it down out of annoyance. And Nader was not even the only annoying character and I could literally feel Lucky's frustration while dealing with all of them. This book brought me a roller coaster of emotions. One minute I was sad, then enraged, then annoyed, grateful, frustrated, etc. The main character goes through so many experiences in his life. Sometimes I really just wished I could reach in and give him a hug. But going through all these emotions was worth it because by the end of the book I was very satisfied and so proud of and inspired by our main character Lucky. I just love how A.S. King was able to speak about so many topics that were quite heavy. Many are topics that Young Adult Novels avoid. Still as these topics came up they were spoken of rather truthfully and plainly in such a strategic way which I really appreciated. King is such a talented writer in the way she is able to really immerse herself into whatever character she is portraying as the POV. I may not know what goes on in a boy's mind but I believe she was able pinpoint exactly what would go on in a boy like Lucky's mind. I cannot wait to read what else she has written. It honestly pains me to think that anybody should experience anywhere near to the abuse our main character gets or even some of the emotions the other supporting characters go through. This is a book I believe will stay with me for a long time in my memory and will always be one of my favorites. I recommend this book to everyone! How do you feel about bully? Is it really that serious or just a way of life? Have you ever experienced or witnessed bullying?